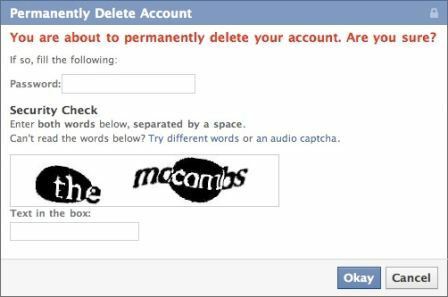 Facebook offers a convenient way to deactivate Facebook account. However, deactivation of Facebook does not completely and permanently the Facebook profile and accoucnt. According to Facebook FAQ, deactivate Facebook account will render user’s profile and all information associated with it immediately inaccessible to other Facebook users. In other words, the account is effectively disappear from the Facebook service. However, the Facebook account is not been purged from Facebook’s servers. Instead, the profile information (friends, photos, interests, etc.) is saved, so that the account can be recovered and reactivated in future with the information intact if the user decides to do so, or regret on the deactivation decision. Permanently delete the Facebook account will completely remove and purge all personally identifiable information associated with the Facebook account from Facebook database. This includes information like name, email address, mailing address, and IM screen name. However, do note that copies of some material (photos, notes, etc.) may remain in Facebook servers for technical reasons, but this material is disassociated from any personal identifiers and completely inaccessible to other users. Facebook users who want to get rid of Facebook once and for what, and do not think that he or she will use Facebook again, Facebook provides a way to delete the account. Once Facebook account is deleted, it’s impossible to reactivate the account or retrieve any of the content or information previously associated in the account. There is no option for recovery once Facebook account is deleted. To delete a Facebook account, log in to the Facebook account, and then submit the “Delete My Account” at https://ssl.facebook.com/help/contact.php?show_form=delete_account. Click on Submit button. Enter the password to confirm it’s your account, and the captcha security spam check. Then click on Okay button. An email will be sent to indicate that the Facebook account will be deleted in 14 days. During the 14 days account deletion grace period, do not login or sign in to Facebook account, nor perform any action utilizing Facebook, such as Share on Facebook on Like in Facebook, or login and sign up to other websites by using Facebook Connect (Facebook user name and password credentials). Any interaction and usage of the Facebook account during the period will prevent the account from being deleted. Within a few days (allows up to a week), an email response should be sent by Facebook to confirm that the account has been permanently deleted. The Facebook account is permanently deleted when user cannot login to the account anymore, and there is not message which offers user a chance to reactivate the Facebook account.